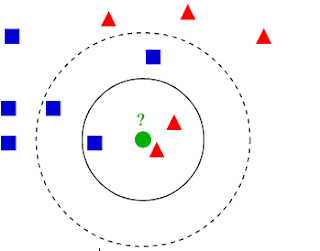 Hi all, in this post we discuss on what 'K- Nearest Neighbors Algorithm' is all about. If you ever come across a classification problem, this solution (K- Nearest Neighbors Algorithm) might be the most simplest of all the classification algorithms you could possibly apply. Implementation of Algorithm in python is available here. Assign the test data to the class which occurs the most in the 3 nearest neighbors (here it is 2 red triangles). Now, let us look the above described method in algorithm form. we assume, availability of training data. Step1: initialize training data (load them in your program). arrange distances in ascending order and put them in a list. select first k distances in sorted list. assign the class which occurs the most in the sorted list.